If some time ago we couldn’t imagine robots in our life, now we meet them even in trivial things. Robots can clean our houses, cook, keep our days organized; whatever. Moreover, they can help our business grow. As you can see, artificial intelligence spreads everywhere to fill any gap in everyday living. Speaking of business, there is an advantageous solution to market your products and services. I’m talking about raucous chatbots! Their huge advantage is the ability to process plenty of requests. They were created to satisfy the mass, so, to pay attention to each client and his question. To say more, chatbots can save you a lot of time and resources. The main thing here is to understand how chatbots work and why your online business needs them. For this reason, we would like to present you a new free eBook, which will help you to understand the nature of these useful AI tools. This guide is written in simple words and has clear examples, so, you won’t get annoyed and bored while reading. First things first, let’s have a look at the contents. Hurry up to download it for free using a form below. By the way, if you often use Messenger, you’re very welcome to sign up for our newsletter by scanning a simple Facebook Messenger code. How often do you meet chatbots on the web? Do they work properly? Please, let us know in the comments section below. We hope that this eBook will help you boost your business. If you are going to start one, have a look at our premium eCommerce templates collection! 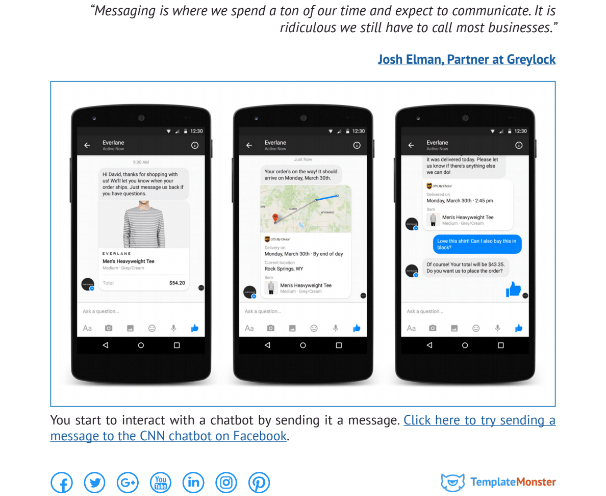 Get the most of chatbots – and thanks for reading!